The funny thing is, this holiday bar from Hammond's Candies wasn't much less expensive than the Theo bar I looked at a couple days ago; in fact, if you counter in size, they might be about the same--Hammond's is probably even more expensive (I'll let you do the math). But I've had some positive inclinations toward Hammond's before, and they do design their wrappers well. Instead of giving a huge Christmas spin to the Candy Cane Crunch's look, it's the same as with their other bars, just in a happy pink color. You see, it doesn't have to be hard to have seasonal offerings. It wasn't until I unwrapped this bar that I realized this is my first time trying dark chocolate from Hammond's. Given the company's candy focus, it won't be surprising that I'm not thrilled by their dark variety. 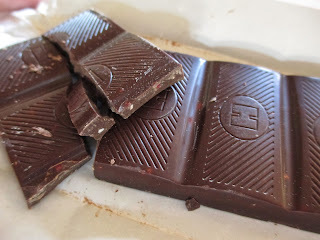 I mean, the milk chocolate wasn't completely thrilling, either, but I feel like it's easier for milk chocolate to fall under par than it is for dark chocolate: milk chocolate is allows to rely on sweetness, but dark chocolate is supposed to be more about the flavor of the chocolate itself. That's why milk chocolate lends itself better to the world of confections than dark chocolate does--and Hammond's, as far as I have seen, dwells in the world of confections. That's why they call themselves Hammond's Candies. 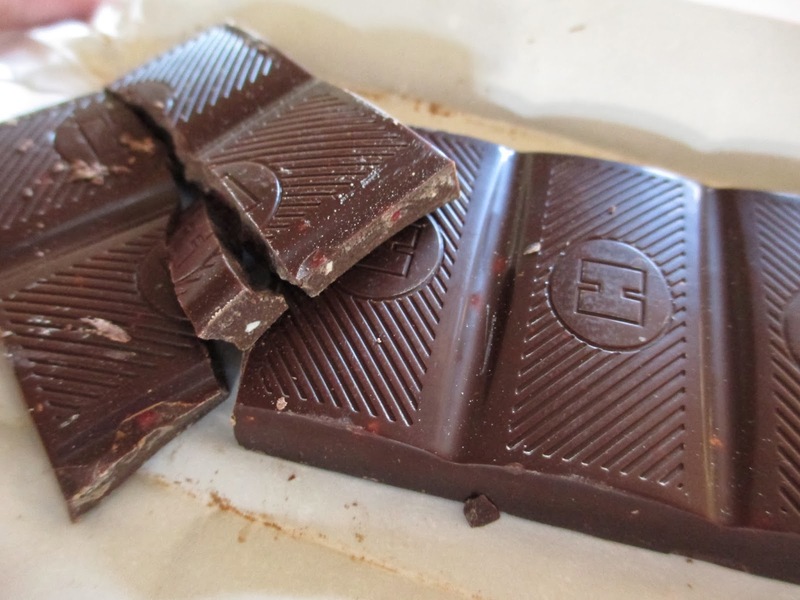 Two of the six squares were already broken when I unwrapped the bar; whether this was my fault or the stores, I don't know, but it didn't exactly make the chocolate look highly appealing. And the primary first flavor I got was the confectionary dark chocolate I was dreading. You know the stuff: flat, sweet, and thick in flavor, like straight Nesquik. It offers none of the complexity or richness of good dark chocolate, but also none of the caramel/vanilla-accented gentleness of milk chocolate. It's stuck in an awkward in-between space. Admittedly, the Hammond's version of this confectionary dark chocolate is not the worst I've had (cough, See's, cough), and I don't mean to say that such chocolate is inedible. It's just not the type of thing I enjoy. So if you're reading this right now and thinking of what a snob I am, by all means, don't let my comments hold you back. If you enjoy chocolate with just a touch of darkness, maybe this variety is for you. I wonder if it is my aversion toward the chocolate that is preventing me from tasting the candy cane very much. It's there, in tiny red, white, and clear crunches. But there is hardly any of the pepperminty taste; it's barely an accent flavor. For a a Candy Cane Crunch bar, especially since it is a holiday offering, I want much more peppermint flavor than this. It doesn't need to be overpoweringly minty, but there does have to be a minty presence. The mint pieces Hammond's uses remind of the ones Ghirardelli puts in their Peppermint Bark chocolate. You know, barely crunchy stuff without any flavor. The chocolate, plus the peppermint, puts this Hammond's bar at two strikes out. As such, I can't say that it was any better than okay. And there is already plenty of okay chocolate candy on the shelves. Mary Poppins: Whimsy or Healing?